More Oil Price Spikes On The Way? Just five months ago, as the global economy was imploding, oil prices tumbled to $30 per barrel. And now that the recession appears to have bottomed out, oil's climbing back upward: A new Goldman Sachs analysis predicts that oil could rise as high as $85 per barrel this year, and then surge to $100 per barrel by 2010—kneecapping the recovery just as it crawls out of bed. One problem is that bargain-bin oil prices forced many producers to abandon drilling and exploration projects during the current recession. 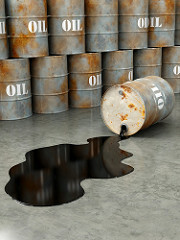 (The glut also crippled investments in alternatives to oil.) So when demand does start ticking up again, particularly in Asia, there won't be enough supply to go around. Now, who knows whether Goldman's predictions will come true, but it's hardly alone in this view: Thanks to fast-dwindling output from non-OPEC countries, pretty much everyone from the IEA to McKinsey is predicting an oil supply crunch at some point in the next few years, just as the recovery starts chugging along. As Kevin Drum notes, these sorts of wild spasms in prices are far, far worse for the global economy than permanently high oil prices. After all, if oil was just consistently expensive, the world would have ample incentive to improve efficiency and develop alternatives, and eventually demand would fall. But instead, we're potentially facing a situation where pricey oil brings about a recession, oil prices then nosedive, no one wants to invest in alternatives or take any measures to reduce demand, a recovery finally gets underway, demand quickly bumps up against supply, and oil prices spike again, inducing... another slump. One way to avoid this scenario would be for countries to pare back their oil usage dramatically and help support alternatives (say, mass transit or electric vehicles). Europe and the United States have actually taken huge steps in this direction since 2008 , but could stand to go further. It's tricky, though: The Obama administration recently ratcheted up fuel-economy standards for vehicles, but no one wants to buy efficient cars right now, while gas is still relatively cheap. Another idea—originally floated by Jason Bordoff and Gilbert Metcalf here—would be for the United States to implement some sort of variable oil tax that would keep the domestic price of oil more or less stable: When world oil prices rise, the tax decreases; when oil prices plunge, the tax increases. That would help create a predictable price signal to encourage conservation and alternatives to oil, and raise revenue for energy projects (not to mention send fewer dollars overseas). It's a slight twist on the gas tax idea, and sure seems preferable to the current course.